This summer, our favorite breakfast was what I like to call the Swiss breakfast of champions: Birchermüesli. The cold cereal is perfect for those mornings when you wake up and complain, "How is it this hot already?" Funny, I never made the cereal while we lived in Switzerland, but I did have it as a snack at the various cafes that serve it. I've heard that it's not strictly a breakfast cereal but rather a light meal for dinner or znuni (9 am snack) or zvieri (4 pm snack). Any Swiss out there can confirm that for me? Another funny thing is that while shopping at Whole Foods the other day, I came across this product from a Swiss company called Familia. 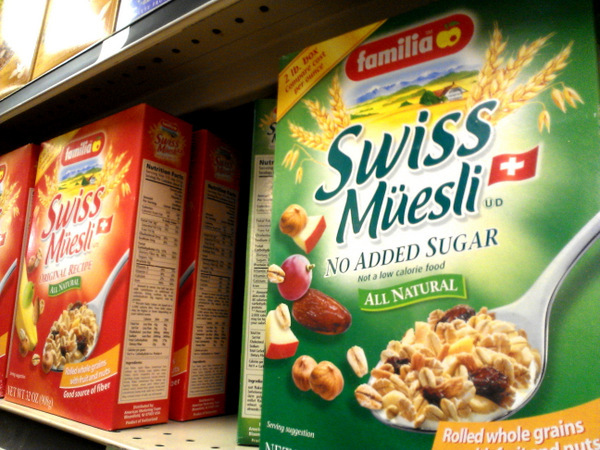 Yup, you can eat Swiss cereal straight from the source. However, I prefer to make my Birchermüesli based on the recipe from this little cookbook. 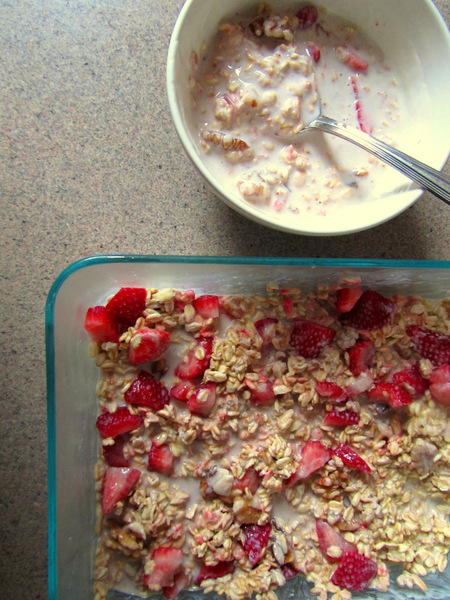 Finally, leave in the fridge overnight so the flavors can mix and so the oats soak up the milk. The cookbook calls for 2 cups of milk to 1 cup of oats, but I found that ratio too watery. The ratio I mentioned makes the cereal nice and thick. I also like to add plain yogurt or kefir to make it creamier. Really, the possibilities are endless. Make this cereal your own! ***More Swiss love... Check out this new book called Swisscellany filled with fun facts about Switzerland! Here's a taste: Did you know Switzerland has 1.59 million cows? Hi Elisa! Thanks for sharing your recipe with us. Now that the markets are starting to bring in more apples, next I will have to try grated apple in my muesli!! I'm so glad I could be of service ;) Let me know how the recipe turns out! I usually like mine with yoghurt. I too never made muesli at home while in Switzerland, but now its an everyday thing! It's any everyday thing for us too! I don't know if I'll ever tire of it because you can switch things up with different fruits, nuts, juices and yogurt!